Alright so long time no blog. I've been busy with a lot this past month, so I've been trying to get back into the anime blogosphere again... so here I am! As with previous anime cycles, winter 2016 delivered a lukewarm batch of anime for our viewing pleasure. Out of the batch, Ajin seemed to hold it's ground against some of the more popular titles. Since Ajin was animated by Polygon Pictures, Ajin was a must-watch for me since I loved Sidonia no Kishi. And with that I'm very pleased to say that Polygon Pictures delivered with Ajin. Immortality is a not so popular topic that's tackled in anime; I can only think of a hand full of anime and characters that fall under the immortal category or use immortality in a great deal. The story of Ajin revolves around these very rare species called "Ajin" who are immortal, but with a twist. The twist is that Ajin are capable to releasing invisible black matter (IBM) which take on a human-like form, have superhuman capabilities and aren't visible to those who aren't of the Ajin species. The anime shows the dynamic between the media, the government, the public, politics with the Ajin at the center of it all. With the 2016 elections heating up, I couldn't help myself find so many parallels between what Ajin was able to portray with the government and media with what's going on with the Clintons, Sanders and Trumps. Anyways that's a completely different blogpost that I won't get into here. In politics there's always some form of fear mongering or false information that's planted out there by the government/politicians, which gets revved up by the media and eventually sway the politics of the general public. Or it's the other way around, where the government keeps hush about everything, and the general public latches on to whatever information that's out there. Ajin does a great job showcasing both of these aspects where the government suppresses information about Ajin, leaving the public with unanswered questions; the anime also does a good job showing how strong and influential figures can use the media to manipulate information to the public, whether the information is true or not. There are three key characters in the anime that play big roles in the anime. First is of course Kei Nagai who is our main character. Kei one day discovers he's an Ajin, gets bombarded by the media quickly after, and gets hunted down by the government. He's an weird/ interesting character to follow since he comes off as an uncaring, cold, lacking compassion and sentiment towards others and a whole slew of other things. Ultimately he wants the government to get off his tail so he can live a quiet, secluded normal life after being shot into fame by the media. He's unpredictable and you can't really pinpoint as to what his actions could be in the anime, which made it interesting for me to watch. Then we have the media/government- I was going to talk about Yuu Tosaki, but it made more sense the make the government and media it's own "character." In the world of politics, influential figures and politicians seem to obsess over big money and political power for whatever gain, and they'll get it at any means necessary, ethical or not. 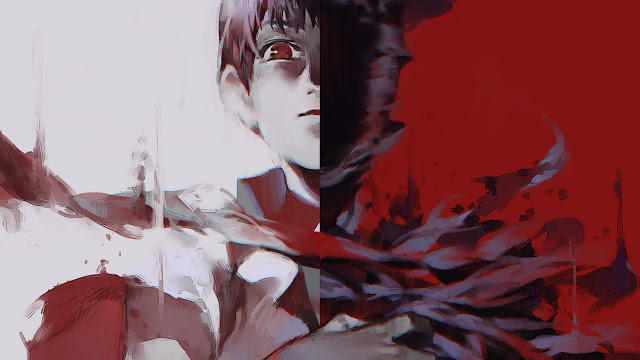 Ajin seem to be a hot button topic around the world, and it's clear after watching the anime, the government uses Ajin for political gains while at the same time keep this information away from the public, and use the media as a means of lying to the public. It was fun to watch portions like this in Ajin because I'm so obsessed about politics to the point where, I can think of many examples where the government says one thing, they're doing another thing behind people's backs and use to media to cover up their tracks. Finally we have, Satou. If my memory serves me correct, he's the first Ajin discovered and he serves as the antithesis of the government in a sense. The government has done several unethical procedures upon Satou, he somehow escapes the grasps of the government and tries his best as gathering other Ajin together to hold government accountable to what they've been dong behind the scenes with Ajin. Satou's a very dark, manipulative, conniving, scary and threatening entity; I liked watching him, although most of the moves he makes against the government were pretty extreme. Animation of the Ajin turned a lot of people off I would assume. Obviously the heavy CGI was not pleasing for everyone, but I enjoyed it. When you compare it to the CGI in Sidonia no Kishi, the CGI in Ajin seems to be not as good when comparing the two... but still good! If you're turned off from the CGI, I feel like that wouldn't be a good reason as to not watching Ajin, since it's a great piece of work done by Polygon Pictures. Always, I rambled on way too long. Ajin has a great story, the episodes were well done, it was very addicting to watch and I really don't have many major complaints other than Kei was kinda weird to watch. I loved how Ajin was able to bridge the gap between the media, government, public and something foreign, using Ajin, together in a way that was very fun, plus informative to watch. As a viewer I was very satisfied and if you haven't seen Ajin yet, go watch it! Please leave a comment below, let me hear your thoughts!